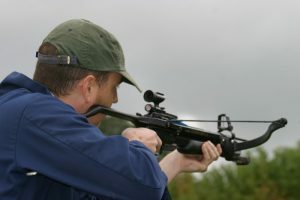 Michigan Therapy Institute performs crossbow evaluations for those individuals that have a disability, either temporary or permanent, that permits full use of only one upper extremity and is unable to hold, aim and shoot conventional archery equipment as determined by evaluation from a physician or a licensed/registered physical therapist or occupational therapist. The evaluation can be completed by our licensed physical therapist at either of our locations in Warren and Macomb. The evaluation takes approximately one hour and consists of medically accepted standard testing procedures to check for muscle weakness or range of motion limitations of the upper extremities. With your assistance, the physical therapist will ascertain which muscle group or joint is the source of the disability. Loss of function must be substantiated. Pain or lack of endurance alone cannot be used as grounds for granting a crossbow permit. There are three tests that we perform: Functional Draw Test, Manual Muscle Test, Impaired Range of Motion Test. Substandard scoring in any area is sufficient proof to grant the permit. Allows for simulation of the drawback posture/position with a weight equivalent to 35 pounds of resistance for a 4 second duration. This is to simulate the motion, strength and duration of hold necessary to use conventional archery equipment. Using a standardized manual muscle grading scale (or an equivalent test), shoulder flexion, shoulder extension, shoulder abduction, elbow flexion and elbow extension are graded equal to or less than 3 of 5. The disability in range of motion is assessed using a standard goniometer (or equivalent) test. A permit may be granted if the applicant score equal to or less any of the joint ranges listed. Shoulder flexion equal to or less than 90 degrees, shoulder extension equal to or less than 10 degrees, shoulder abduction equal to or less than 70 degrees, elbow flexion equal to or less than 90 degrees, elbow extension equal to or less than -20 degrees. Note: A person is not allowed to seek a diagnosis for the purpose of meeting these requirements more than two times within a six month period. Once the evaluation is completed and signed by the licensed physical therapist, it is up to the Disability Bow Program of the Michigan Department of Natural Resources to accept and approve. The applicant must complete sections 1 and 2 of the Disabled Bow Permit application and give it to the physical therapist. The therapist will complete sections 3 through 5 certifying your qualifications for the permit. Make sure to include all requested information. The application will be returned if there is any missing information. The therapist’s findings are sufficient. You do not need a physician’s signature also. You must send the original signed document. No scanned or faxed applications will be processed. Keep a copy of the completed application for your files. Please contact the Michigan Department of Natural Resources, Licensing and Reservation at 517-284-6057 if you have any questions regarding the application. You can also visit their website at www.michigan.gov/dnr for more information on permits for hunters with disabilities. The Application is located in the Patient Forms navigation bar at the top of the web page. Please open, print it and complete the sections stated above and bring it with you the day of your appointment. We look forward to assisting you in obtaining your permit so that you can participate in the bow hunting season and get back to enjoying your sport again.